We all need just a little help every now and then, and offering our hands in Christian friendship is a priority at Pflugerville FUMC. We focus on our neighbors through a variety of on-going ministries. Paula’s Food Pantry and Clothes Closet provides food and clothes to our neighbors on Tuesday mornings from 8:30 – 12:00 in the Family Life Center. We serve the Pflugerville area and beyond. Backpack Pfriends provides a weekend extension of PISD no-cost lunches for students in need. Some of the PUMC adult small groups pack 2 lunches of non-perishable items into backpacks that are distributed to the students each Friday. At Pflugerville FUMC we practice "Seeking & Sharing God' Love With the World" by loving our Neighbors. A number of our community outreach programs include. The Central Texas Bloodmobile visits Pflugerville FUMC twice a year, and the Big Pink Bus (Mammography) makes a monthly stop at our campus. Blue Jean & Undie Sunday in mid-August when Pflugerville FUMC collects new and gently used blue jeans along with new undies with the donations going to students in the Pflugerville ISD. On Blessing of the Backpacks Sunday Pastor Rusell blesses children’s backpacks as they begin a new school year, and additional backpacks are collected for Pflugerville ISD students. 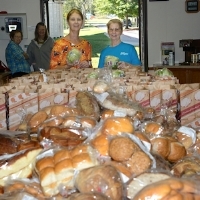 Pflugerville UMC members feed our homeless brothers and sisters through the Street Meal Ministry. This group prepares and packages hot meals, loads them into a church van, and distributes the meals in the Pflugerville area. Nursing Home Ministry: Pflugerville FUMC members offer singing and a devotional at the Pflugerville Health Care Center the second Sunday of each month. Center Residents enjoy hearing a devotional message and singing the ‘old-time’ hymns and gospel songs.